The Cubs always felt it was a long shot they’d land Joe Girardi as their next manager, but it won’t stop them from appealing to his Chicago-area roots in an effort to hire the man they feel is perfect for this stage in their development. Let’s be real, the Yankees would be stupid to let Girardi go without tying him up with a lucrative deal. Girardi was one of the top managers in baseball this season. You normally can’t have that many injuries — lose that much payroll — and survive. The Yankees not only survived, they took their quest for a playoff spot into the final week of the season. The Cubs, meanwhile, dumped Dale Sveum as manager after two seasons, feeling he didn’t develop their top young players — mainly first baseman Anthony Rizzo and shortstop Starlin Castro, whose performances declined this season. Sveum, who was immediately hired to be part of Ned Yost’s coaching staff in Kansas City, faced Theo Epstein’s firing squad as a result. Girardi is a nice combination of analytical and unsystematic, which made him so attractive to Yankees general manager Brian Cashman, who is cut from the same cloth. That’s why Girardi also fits the Cubs with the Epstein/Jed Hoyer philosophy. But if the Cubs were able to land Girardi, whom would the Yankees hire as their new skipper? No one really stands out. Word is it wouldn’t be Tony Pena, the current bench coach. Don Mattingly? The Dodgers would have to fire him or the teams would have to work out a trade. Girardi’s contract runs through the end of this month, so unless the Cubs receive permission to speak to him, there’s no way they can get a jump on this. The Yankees and Girardi’s agent have been meeting, trying to hash out a new deal ahead of the current contract expiring. Girardi’s deal is expiring at the right time, because the Cubs are interested, and who knows what the Nationals’ level of interest is with Davey Johnson retiring? “He’s [Cashman’s] guy. Cash brought him in and he’s the guy Cash would like to re-up,” said the Yankees official. Why did the Yankees wait this long to negotiate with Girardi, and was it Girardi who wanted to play this out? Those questions are unanswered. The one downer for Girardi with the Yankees is the roster. We know the Yankees will field a team next season, but their list of pending free agents is enormous. Mariano Rivera and Andy Pettitte have retired. Hiroki Kuroda is being wooed to return, though his performance in the second half suggests he’s not what he used to be. Phil Hughes, Curtis Granderson, Robinson Cano, Lyle Overbay, Mark Reynolds, Joba Chamberlain, Boone Logan, and Kevin Youkilis are free agents. Alex Rodriguez is likely to be suspended for the 2014 season. As it stands, Girardi would have a returning cast of Mark Teixeira, who missed most of this season with a wrist injury, Ichiro Suzuki, Vernon Wells, Alfonso Soriano, Derek Jeter, Brett Gardner, CC Sabathia, Ivan Nova, David Phelps, and David Robertson. Girardi will be challenged, but it’s nothing millions of dollars of free agents can’t cure. What the Yankees don’t have is a rich farm system that can absorb some of the losses. For years we heard the Yankees were old, but in 2013 it finally caught up to them, although Rivera still performed at a high level at age 43. Jeter is the player they’re concerned about. Injuries limited him to 17 games this season. Will an offseason cure him, or will he be limited to being a designated hitter next season? Cashman will have to think about acquiring a shortstop, unless he feels Brendan Ryan is sufficient, because Eduardo Nunez has shown to be too erratic to be the everyday shortstop. Cashman will also have to come up with a replacement for Rodriguez at third. Even with the free agents and retirees, the Yankees remain old. Suzuki will be 40 next season. Wells will be 35. Soriano will be 38. Jeter will turn 40 halfway through the season. This is the core. So they either have to create a new core or build around what they have. Yankees president Randy Levine is on record as saying there is a point where the Yankees would say no to Cano. If he’s seeking $30 million per year, as reports have indicated, he likely won’t get it from the Yankees. The Yankees will definitely appeal to Cano’s emotions about staying in New York where he’s comfortable, and being in a Yankees uniform for the remainder of his career. These are all factors Girardi must weigh. The Yankees have to do a better job with their farm system, scouting, and acquiring top international players, as the Red Sox are doing. That’s where the rebuilding must take place. So, as Girardi mulls proposals, all of those things will be swirling in his head. It’s hard to say no to the Yankees. It’s baseball’s top managing job, but Girardi has picked a great time to be a free agent, and he’ll reap the benefits of being wanted. In addition to the Cubs’ vacancy, there are managerial openings in Washington, Cincinnati, and Seattle. One firing we did not anticipate was Dusty Baker losing his job in Cincinnati. That creates all sorts of interesting scenarios, one of which could be Tony La Russa’s name being thrown into the ring because of his friendship with Reds owner Bob Castellini. La Russa has a nice job with Major League Baseball, but we’ll see if he’s reserved the right to change his mind after he said he would never manage again when he retired from the Cardinals. Other obvious names will surface, such as Reds great Barry Larkin, whose name has also been linked with the Nationals. Bryan Price, Baker’s pitching coach, has been mentioned as a future manager (possibly even with Seattle). Would the Reds risk letting him go? Or do they want a clean break from Baker’s coaches? Bob Boone, who spent many years in Cincinnati, could also be a possibility. There are the bench coach/Triple A types who could fit in certain markets. The Red Sox have two of those in Pawtucket manager Gary DiSarcina and Boston bench coach Torey Lovullo. Teams often seize on coaches from successful programs. Tampa Bay’s Dave Martinez, Texas’s Dave Magadan and Mike Maddux, Price, Cleveland’s Brad Mills, the Dodgers’ Tim Wallach, and Detroit’s Gene Lamont could all be considered. Another possibility is Jim Riggleman, who could emerge in Cincinnati. Riggleman is considered a solid manager, and organizations are starting to forget that he quit on the Nationals during a contract dispute. There are only two African-American managers, Houston’s Bo Porter and Texas’s RonWashington. Don Baylor, who has managed the Rockies and Cubs, would love a third chance. DeMarlo Hale is another strong African-American choice, while Willie Randolph and Cecil Cooper have experience and could become candidates. 1. It’s been out there that the Dodgers won’t be bidders for Robinson Cano. But remember this: What’s said before a team is eliminated from the playoffs, and what’s said after, can be different. If the Dodgers bow out quickly, look for the Cano talk to pick up in LA. 2. Theo Epstein may not have carte blanche with finances like he thought he did when he took the job in Chicago. 3. 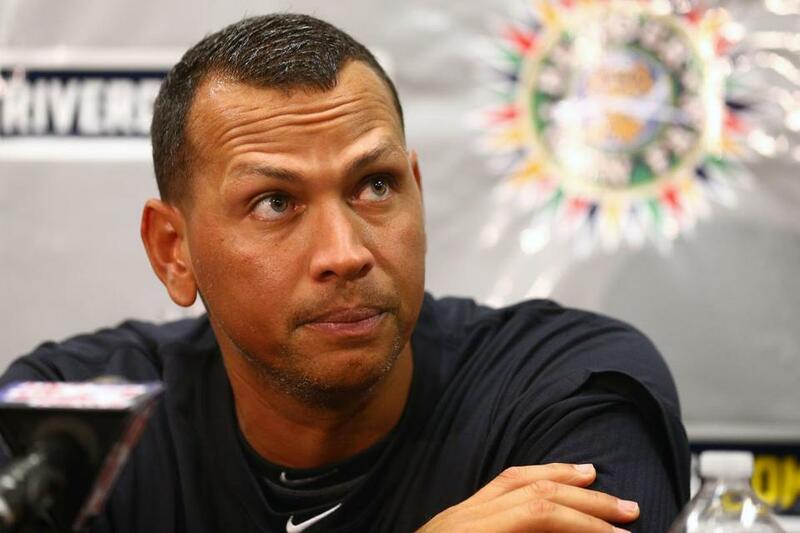 Alex Rodriguez is suing Major League Baseball. No sports league wants to get sued, even as frivolous as some lawsuits are, because it brings up all kinds of issues, such as full disclosure, opening up records, and in baseball’s case, answering questions it would rather not in terms of steroids and how long it knew there was a problem before anything was done. A-Rod may get nothing out of his suit, but it’s uncomfortable for MLB. 4. Why would the Red Sox have to send a physical therapy intern to Venezuela to oversee Felix Doubront’s workouts? One would think that by now Doubront would have figured out he needs to be in top shape to pitch 200 innings. 5. Two books I can’t wait to read: Pedro Martinez’s with Michael Silverman, and Tom Menino’s on his mayoral run in Boston. 6. Can’t help but think that if Jacoby Ellsbury departs as a free agent, Matt Kemp’s name will pop up once or twice with the Red Sox. Yes, he’s hurt a lot, but the Dodgers may be looking to move him. 1. Bronson Arroyo, RHP, free agent — Arroyo, 36, said he wants a three-year deal and feels his career in Cincinnati is likely over. “I have no preference on where I want to pitch but I’ll certainly consider the team, their chances of winning, and all of that,” he said. “I feel I can pitch effectively at 37, 38, and 39 years old. I’ve never missed a start. Never been injured. I’m not a max-effort guy out there, so there’s no big-time wear and tear on me. I loved Cincinnati but I don’t think they’re in position to give me what I want.” Among the teams that could be bidding are the Blue Jays, Orioles, Brewers, Cubs, Giants, Pirates, Cardinals, and Dodgers. 2. Bud Black, manager, Padres — Black’s name always comes up as having a future role with the Angels, for whom he served as Mike Scioscia’s pitching coach for years. One role could be as Scioscia’s successor. For now, Black seems to be OK in San Diego. Scioscia’s current pitching coach, Mike Butcher, is on the hot seat because of the Angels’ underperforming staff. We’ll see if there’s a change there. 3. Howie Kendrick, 2B, Angels — It looks more and more like Kendrick will be involved in a deal that would land the Angels some pitching or prospects. The Royals seem like a good fit as they attempt to solve their second base issue, and Kendrick would be a nice bat in that lineup. But what would the Royals give up? The Orioles are another possible fit with Brian Roberts’s tenure possibly ending soon. The Orioles haven’t decided to cut ties with the free agent, but they certainly wouldn’t re-sign Roberts for more than one season with his injury problems. 6. Ubaldo Jimenez, RHP, free agent — Jimenez has suddenly become one of the hot commodities on the market. The only question is whether the Indians make an attempt to retain him, or are they content to go with their younger pitchers and let Jimenez go and use the money elsewhere? Jimenez was nearly released in May because he was pitching so poorly, and that was after a horrible 2012. But he has great stuff, turned his season around, and now someone out there is going to pay him a lot of money. The Jays and Orioles are surely lining up in the AL. 7. Arte Moreno, owner, Angels — GM Jerry Dipoto and Scioscia are getting the blame, but it’s becoming evident that Moreno could be the major problem with the Angels. He’s made some poor decisions in personnel, including pressuring the front office to sign big-name players. “I think he has to take a look at himself and learn to stay out of it and name a president who can oversee the baseball,” said an AL executive. An Andy MacPhail/ Joe Garagiola Jr. type to bring some sense to the operation seems in order. 8. Jhonny Peralta, INF, Tigers — Where would Peralta fit next season? There’s some speculation that as part of their objective to go after “good value” veterans, the Yankees might entertain Peralta as a third baseman to replace Alex Rodriguez. Peralta would also protect them at shortstop and add a power righthanded bat to the lineup. But again, with all of these PED violators, there’s the “year after” factor. Melky Cabrera was a disaster in Toronto, both offensively and defensively, the year after his suspension. 9. Bartolo Colon, RHP, Athletics — At 40, could Colon be one of the most sought-after pitchers in the offseason? He is making $3 million this season, and that will probably triple next year, even with his sketchy PED history. Would the A’s pay up? Colon will likely get two years somewhere, and you can start with the Orioles and Blue Jays. From the Bill Chuck files: “Prince Fielder had 712 plate appearances without a triple, but only one game with a single, a double, and a homer.” Also, “Texas had 34 bases-loaded singles, the most in the majors, followed by St. Louis and Cincinnati with 32 each.” And, “The Rays only allowed 878 singles this season, the fewest in the AL. The Red Sox were next with 903.” . . . Happy birthday, Joel Hanrahan (32), Darren Oliver (43), Robert Person (44), and Oil Can Boyd (54).